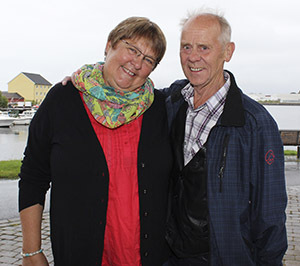 HEALTHY HEART: On Christmas of 2006 Sigrun Ugedal from the town of Roan had a heart attack. Her husband Leif Jørgen therefore called Svein-Magne Pedersen, and God healed her heart. In the Christmas of 2006, Sigrun Ugedal from Roan had a heart attack, and everything looked bleak for the family. But Jesus turned the situation around and made sure they had a Christmas they would remember for life. On December 21, 2006, Sigrun Ugedal felt very ill in her body when she awoke in the morning. She had pain in the upper chest and had to go to the toilet to throw up. Eventually she felt pain in her arm. Sigrun worked at a nursing home and knew that several of the patients had experienced such symptoms associated with heart attacks. -I have such pain in my chest. Am I really going to die right before Christmas? she asked her husband in despair. Sigrun contacted the emergency room and was told to come down right away. The doctor examined her with an ECG. He was certain that this was a heart attack, and that she needed to be sent to the hospital. -I asked if it could wait until after Christmas, but the situation was serious. Shortly after I was sent with flashing blue lights and sirens to Namsos hospital that was 120 kilometers away. Her husband, Leif, was naturally very distraught with the thought of sitting there alone at Christmas. He traveled with his son to the hospital. The condition of Sigrun was very poor. She lay in bed and could not carry on a conversation - Sigrun preferred that they went home. Later she was sent to Trondheim. -We went home, but I was very pessimistic about the situation. When we were back at home, I sat down and watched TV. Then I came across a channel that I had not seen before. There was a TV program where Svein-Magne prayed for the sick who called in, says Leif. He tried to call several times, but because of a thunderstorm his landline did not work as it should. Eventually he came through on the telephone. -God can heal both minor and major heart attacks, said Pedersen. Leif thought that the preacher took the situation a little bit too lightly, but was still happy to receive prayer. That night he slept very well despite the circumstances. On Christmas Eve Leif made the trip to Trondheim to visit Sigrun again. The doctor then examined her again. He could not find anything wrong. -Is this normal? Sigrun asked. -No, it is not, the doctor replied and was very surprised. Sigrun was therefore sent home to Roan on Christmas Eve. She was not given a sick leave. At home Leif and the kids were waiting. They had decorated and readied everyting. Sigrun had almost forgotten that it was Christmas Eve, but now this would be a Christmas she would remember for a lifetime. -This is the closest I've been to heaven, she said when she saw all the candles her kids had lit in the livingroom. She has not had any heart problems since then. God did a great job. I have told people at my place of work about what happened, but they're a bit skeptical. I believe that God intervened and gave us a Christmas present we never will not forget, she concludes.